RadiantGUARD offers quality radiant barrier and reflective insulation products at competitive pricing to contractors, resellers, dealers, and distributors. Our goal is to provide companies the best products, information to encourage success in their marketplaces. Why choose RadiantGUARD as your reflective products supplier? RadiantGUARD products are offered to resellers are lowered reseller prices using special "reseller" login website account. RadiantGUARD products are manufactured from the highest grade materials and manufacturing processes resulting in consistent quality. 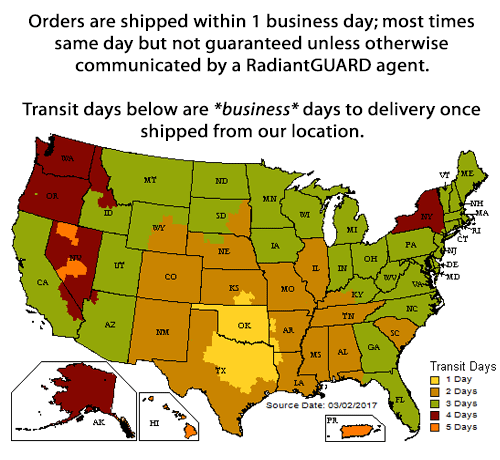 RadiantGUARD products are always available. We maintain over 1,000,000 square feet of radiant barrier in stock ready to ship on warehouse floors at all times in order to keep our consumers supplied with a consistent supply chain. RadiantGUARD products are priced competitively and we offer advantageous discounts for volume purchases. RadiantGUARD products can be blind drop shipped to provide distribution anonymity for rebranding purposes. Want to become a RadiantGUARD Reseller? will contact you with details. We offer customized co-branded literature to help companies get their business off the ground marketing alongside our established brand name, RadiantGUARD. Buy RadiantGUARD products and rest assured that you have the most respected, highest quality reflective products in the industry.